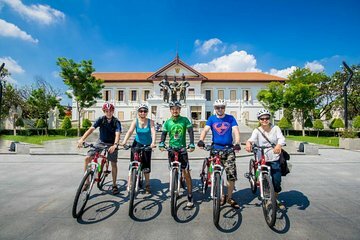 Pedal de historiske gatene i Chiang Mai gamleby med en 4-timers sykkeltur som tar i gamle templer, lokale markeder og landemerker. Følg guiden din langs bakbanene mens du lærer om byens kultur og historie. Utforsk Wat Chiang Mun og oppdag Chiang Mai 'navle' før du møter byens tre kongelige grunnleggere. Pause på et veikantmarked for fersk juice og thailandsk søtsaker, ta inn de gamle steinene til Wat Chedi Luang, og pass gjennom Tha Phae Gate på vei til et Somphet Market for lokale snacks. Great morning dispite the rain. Tour guide spoke very good English and was very knowledgeable about the sights visited. It was great he could share his wisdom on certain aspects of the sights visited including buddist culture and belief. Great riding around the back alleyways of the old city and not to mention the lovely aroma of the local food being cooked filling the air. The tour was much more than we expected with the tour guide Kiki making the tour. I would certainly recomend this tour early in your holiday as it is a good way to familiarize yourself with the city. We had the pleasure of having Puna as our guide. A young woman with excellent English, and she was not afraid to use it. She told us her name means field crab.We were a group of four and found the cycling experience of this busy city to be at an easy level. Puna giving competent directions from the lead. We were versed in hand signals before we left. The bicycles are new and easy to ride. A free drink bottle, with water is also included. This particular city exploration lasted about four 4 hours in both early morning heat and mid day rain , such a nice thing to do cycling in rain on a hot day. I would recommend people do this cycling tour on their first day or as near as possible, as it is a great way to orientate yourself to the old city. We visited three 3 temples, the city centre exactly the three king monument and a local food market where we sampled local fruits and deserts. Puna allowing us to choose what to try. No question was beyond Puna's ability to respond. Grasshopper abvetures is a great llocal company with friendly people and easy to use, new bicycles. I have said that twice as I was so impressed at them being new bicycles Use this company they are brilliant. They will also recommend places to eat and visit after the cycling if you need to ask. I went on a tour with Boy and Aom. The bike tour was nicely paced and insightful. Most of the tour was lead by Aom who was very informative, professional and friendly.We visited a locals' only market along with some temples and other sights. Aom was constantly informing us of various aspects of Chiang Mai history and culture while remaining friendly and charming. Grasshopper overall I felt was very professional, safety oriented and friendly. Every employee I encountered was nothing but helpful. I'd highly recommend this tour to anyone. We did this tour with our 4 children ages 10, 7, 4, and 1.5. They had kid sized bikes, baby seats, and tag-a-longs that were perfect for our family. The guides kept everyone safe on the streets as well! It was very interesting to wind down little side streets, visit different temples and learn more about Buddhism and its role in Thai Culture. We also visited a market and some street vendors. I learned I love jackfruit and I tried tamarind juice and some sticky rice steamed inside of bamboo. It was great fun for the whole family! Great tour thru the old city, very fun on the bikes. Our guide Puna was outstanding. Highly recommend! This Bike tour was absolutely amazing! Our tour guide, Boy, was the best! He was very patient, very well informed and knew the city's beautiful history. He spoke superb English which was a plus. The tour began with an explanation of the route we would take and an introduction to our bicycles. He then, explained the rules and confirmed we knew the hand signals before our adventure began. I was a bit nervous in the beginning because I had my two sons along for the ride as well. They are ages 10 and 12. However, Boy was so patient and very careful throughout the entire journey. This was a great way to see the city. My partner and I went early October and it was just us, with our tour guide Boy. Plenty of knowledge on the city answering every one of our questions even when totally off topic. We did this tour at the start of our time here in Chiang Mai, and we were able to fill in the remainder of the days with what we saw whilst on this tour. All biking was flat and Boy set an easy pace, so we could take in all of the sites. Took our Go-Pro with us too, great footage! Highly Recommended! Really a great way to tour the old city. Our guides were very friendly. Clear about safety. We saw and learnt about a few old temples, tasted fresh juices and fruits, visited markets and had delicious local coffee. A really fun and interesting tour. Really worth it!